Happy Veterans Day to real veterans and fictional veterans alike! Wild Guess Preview: The team is short on grenades and ammo, but when they make their regular run to Vigilante Weapons Surplus, they find they’re short on funds, too. Face works out an awkward deal where their missions are supported by a new luxury car maker from Europe – now they’re driving a posh sedan instead of an awesome van, and while they have money for grenades, they don’t have anywhere to store them. The Recap: There’s a familiar voice on the radio… it might be… it could be… it is! “Hello everybody, with Hall of Famer Lou Boudreau, Dewayne Staats and Vince Lloyd, this is Harry Caray at Wrigley Field…” and instantly this is my favorite episode. Yes, we’re in Chicago, and while things are looking up for the Cubs after a big Ryne Sandberg home run, things are not looking up for the residents of a run-down old apartment building; the women have to push their way past some unshaven street toughs just to get into the place. One of them is Della Reese, and when she warns the thugs to “behave” they throw her down the stairs. Her elbow is broken, but not her spirit: “You boys have buried yourselves. Deep.” How can she be so sure? She’s B.A.’s mom. Oh man, those guys aren’t going to live through the first commercial break. B.A. is mad as hell that someone did not treat his mother right: “Nobody puts their hands on my mother and lives to tell about it!” We should also point out that when she calls the mobile phone in the awesome van, she asks for “Mr. B.A. Baracus… the head of the A-Team.” Nice. And since he’s so fired up, B.A. basically does take charge; he tells Face to scam a plane because they’re flying to Chicago. Seriously? Face suggests maybe they drive, but B.A. grabs his shirt and says “I wanna FLY.” Wow. Poor B.A., he’s trying so hard. So they fly – B.A. even checks out the cockpit with Murdock and mutters, “Just think… I’ve been a fool all these years” about flying. They haven’t left the ground yet, of course. Murdock goes into a commercial pilot rap over the PA, saying he’s just waiting “for our final clearance.” B.A. yells back “Mama’s waitin’, fool!” There’s the clearance! B.A.’s gritting his teeth as they start down the runway, so Face and Hannibal take pity on the guy and give him some “oxygen” so he falls asleep. “Now that’s the kind of service you don’t get on coach,” Hannibal laughs. Soon they’re in Mrs. Baracus’s sumptuous apartment in Chicago, where B.A. introduces his mom to the rest of the team. She looks Murdock over and says “he doesn’t look like a crazy man.” “Wait til you get to know me!” Murdock says. Howlin’ Mad also has a camcorder running, to preserve the moment for posterity; B.A. tells him to put it away, but Mom says to keep it running, since she has “so few pictures of Scooter and me.” Scooter? We love it when a pie comes together. The other tenants are scared of standing up to drunken thugs in ripped t-shirts, but Hannibal says the team will be their security force and make the building safe again. Two of the thugs, Rico and Little Tommy, crash the meeting and start talking trash – bad idea, because B.A. pounces on them and justice is served piping hot. Hannibal tells them to get lost – “we’re out of your lives,” says Rico. Good. The other toughs are still on the front stoop, though, so there’s still work to do. Murdock kicks this scheme off by walking outside and practicing yo-yo tricks, posing as a nerdy guy. Alvarez, a thug who’s also the new building super, says “go yo-yo somewhere else,” a magnificent, memorable quote, but Murdock says his mommy wants him to stay close to the building. He also says his mom is the new head of the tenants’ association. 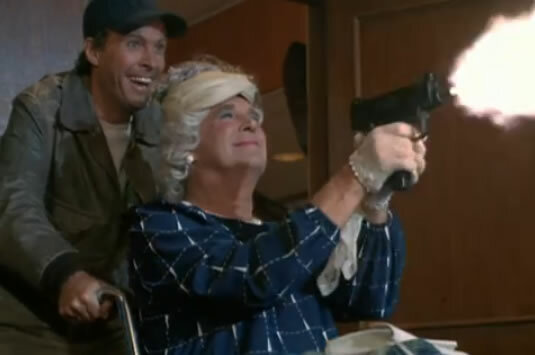 Alvarez is mad, so he goes up to Mrs. Baracus’s apartment and meets Murdock’s mommy – Hannibal dressed as an old woman. Oh my god this episode just keeps getting better. The toughs smash up the apartment; Hannibal and Murdock pretend to be helpless and say “oh no!” a lot. Alvarez says they have 24 hours to move out, and also here’s $25 bucks to help with moving expenses. That was nice of him, sort of. The toughs high-five each other and drive off in a van, but B.A. and Face are watching, and they follow in a K-car. Alvarez heads to Harrington Tower, where he meets with a couple of suits and promises to have the building cleared by the next day. The suit guys are happy. Face was eavesdropping during that conversation, and he reports back to Hannibal: they can’t figure out why Alvarez is working for Harrington’s building management company. Karen the neighbor says the building doesn’t even use a management company. Mrs. Baracus wants to take Scooter and bust heads, but Hannibal suggests the head of the tenants’ committee should handle it. There’s so much awesome going on in this scene, you might need to look away. And so Mrs. Murdock drops by Harrington Tower to talk to the suit guys herself, ah, himself, whatever. The lead suit guy, the one with the walrus mustache, says he’s not involved in their building, but Hannibal/Mrs. Murdock says Alvarez told them to come over – sowing seeds of discontent, very clever. They read their list of demands, but the mustache guy says “meeting over” and tries to hustle them out of the building. “Not quite,” says Mrs. Murdock: H.M. smacks the other suit guy in the forehead with a yo-yo, and then Mrs. Murdock pulls out a machine gun and starts shooting up the office. The Monty Python Pepperpots are Delta Force! Mrs. Murdock tells mustache guy to fix the building up or they’ll mail their list to the housing commission. This is for not driving a K-Car! Hannibal’s figured out that Chadway is engineering some kind of shady redevelopment scheme, and that Mama Baracus’s building is the big obstacle. Mama is organizing a building watch, where people monitor each floor and report back to her via walkie-talkie. Good thing, too, because Alvarez and mustache dude are starting an accidentally-on-purpose electrical fire. The team clears the building, pulls a drainpipe off the side of the place and uses it as a makeshift firehose. The toughs try to drive off, but Face tackles them before they get to their car, and the team easily wins the ensuing fistfight, with the tenants cheering them on. Mama places the mustache guy under citizen’s arrest: “If you try to move I’ll slap you silly.” Mother, there is no other, so treat her right! Yeah! Hannibal still wants to know who owns the building, so Face and neighbor Karen pay a visit to City Hall. Murdock and Scooter head over to Chadway Plaza to keep an eye on the dude. When they all clear out, Mama shares a bittersweet moment with Hannibal, about how much she misses B.A. and how one Christmas he’d sent her a picture of the team with a note that said “Don’t worry Mama, I’m not alone for Christmas.” Awww. Neighbor Karen isn’t having much luck at the property records office, maybe because Hildy Henderson (Liz Sheridan, Mama Seinfeld) is behind the desk and she’s not taking any guff. Face comes in and acts like he’s working for the mayor’s reelection committee and that Karen is a ne’er-do-well from the other side, and that Hildy is right to keep her out of the files. Hildy escorts Karen out of the office, and while she’s gone Face he grabs the property folder. Man, Bears references, hardball politics, Harry Caray… this show knows its way around Chicago! Murdock even mentions the Aragon Ballroom! The real building owner is an old guy living in a retirement home, and he doesn’t know nothing about owning no building. Oh, Chadway owns the retirement home, so he’s just a front. Hannibal’s eyes get bright and he calls Chadway on behalf the old guy, saying “the new owner” is willing to sell for $2 million, or maybe they’ll call the mayor’s office or the police department and see what kind of an offer they think is fair. Chadway drives over right away and meets with Hannibal. They “sell” the building over, but Hannibal gets Chadway to admit he was clearing out the other buildings illegally; he even threatens the team for good measure. Murdock, who’s sitting in a nearby dumpster, says he got the whole encounter on videotape. Nice. I’ve got an advance copy of “Body Slam”, everybody! Said proper owner is entertaining the mayor and other VIP’s at a party to celebrate the hotel he wants to build; they’ve even got a giant hotel-shaped cake. So why does he need all this subterfuge if the city’s behind his project? Chadway wants to show the partygoers a video about his hotel plans, but the team walks in and they have a video of their own. Chadway and mustache guy decide to act all nonchalant by running out the door. The team follows and they get into a nice gun battle, which ends when Face does a flying tackle onto the stache. Chadway flees to his helicopter, but Murdock is in the pilot’s seat. B.A. pulls him out and punches him, for fun. Champagne glass full of milk. And there’s peas, too! And now… party time. Mrs. Baracus throws a little Christmas party in July, to say thanks, and kicks it off with a champagne toast – B.A. drinks a champagne glass full of milk! Karen has more good news: that old fella that owned the building has decided to move in, and he’s turning the place into a co-op so the tenants can become owners. Mama says she’s enjoyed meeting the team, especially Murdock, who’s so crazy she wants to adopt him. Murdock loves this; now he can be “the long lost brother [B.A.’s] never had!” B.A.’s so touched he chases Murdock out of the room. Mrs. Baracus never seemed to notice Hannibal gradually taking (back) charge as the episode went on?